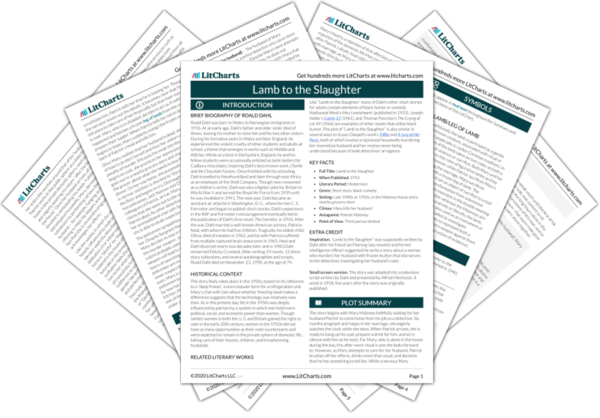 Instant downloads of all 946 LitChart PDFs (including Lamb to the Slaughter). Welcome to the LitCharts study guide on Roald Dahl's Lamb to the Slaughter. Created by the original team behind SparkNotes, LitCharts are the world's best literature guides. A concise biography of Roald Dahl plus historical and literary context for Lamb to the Slaughter. A quick-reference summary: Lamb to the Slaughter on a single page. In-depth summary and analysis of every of Lamb to the Slaughter. Visual theme-tracking, too. 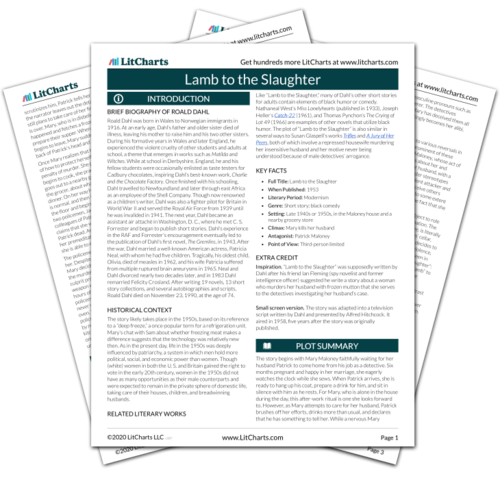 Explanations, analysis, and visualizations of Lamb to the Slaughter's themes. Lamb to the Slaughter's important quotes, sortable by theme, character, or . Description, analysis, and timelines for Lamb to the Slaughter's characters. Explanations of Lamb to the Slaughter's symbols, and tracking of where they appear. An interactive data visualization of Lamb to the Slaughter's plot and themes. Roald Dahl was born in Wales to Norwegian immigrants in 1916. At an early age, Dahl’s father and older sister died of illness, leaving his mother to raise him and his two other sisters. During his formative years in Wales and later England, he experienced the violent cruelty of other students and adults at school, a theme that emerges in works such as Matilda and Witches. While at school in Derbyshire, England, he and his fellow students were occasionally enlisted as taste testers for Cadbury chocolates, inspiring Dahl’s best-known work, Charlie and the Chocolate Factory. Once finished with his schooling, Dahl travelled to Newfoundland and later through east Africa as an employee of the Shell Company. Though now renowned as a children’s writer, Dahl was also a fighter pilot for Britain in World War II and served the Royal Air Force from 1939 until he was invalided in 1941. The next year, Dahl became an assistant air attaché in Washington, D. C., where he met C. S. Forrester and began to publish short stories. Dahl’s experience in the RAF and Forrester’s encouragement eventually led to the publication of Dahl’s first novel, The Gremlins, in 1943. After the war, Dahl married a well-known American actress, Patricia Neal, with whom he had five children. Tragically, his oldest child, Olivia, died of measles in 1962, and his wife Patricia suffered from multiple ruptured brain aneurysms in 1965. Neal and Dahl divorced nearly two decades later, and in 1983 Dahl remarried Felicity Crosland. After writing 19 novels, 13 short story collections, and several autobiographies and scripts, Roald Dahl died on November 23, 1990, at the age of 74. 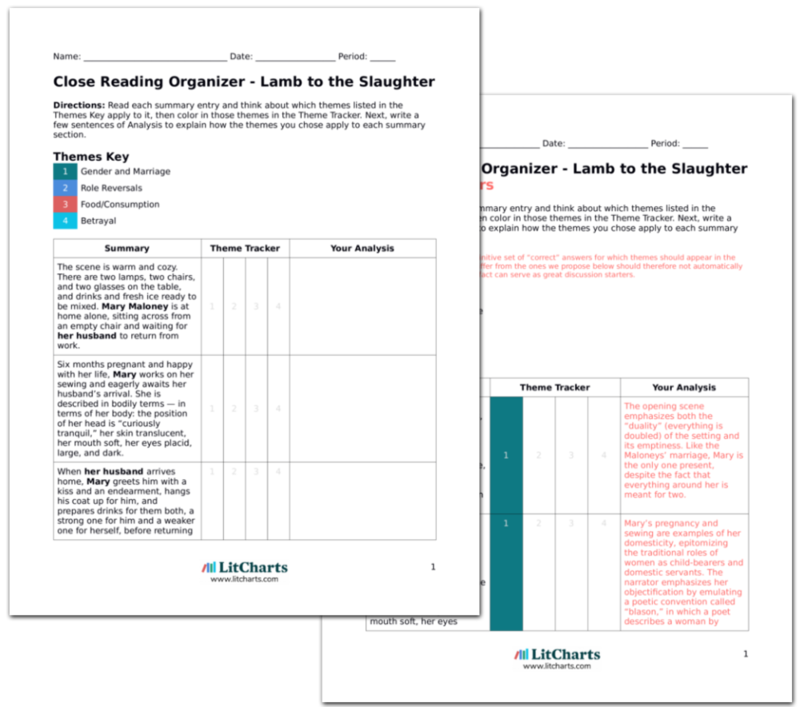 Get the entire Lamb to the Slaughter LitChart as a printable PDF. The story likely takes place in the 1950s, based on its reference to a “deep freeze,” a once-popular term for a refrigeration unit. Mary’s chat with Sam about whether freezing meat makes a difference suggests that the technology was relatively new then. As in the present day, life in the 1950s was deeply influenced by patriarchy, a system in which men hold more political, social, and economic power than women. Though (white) women in both the U. S. and Britain gained the right to vote in the early 20th century, women in the 1950s did not have as many opportunities as their male counterparts and were expected to remain in the private sphere of domestic life, taking care of their houses, children, and breadwinning husbands. Like “Lamb to the Slaughter,” many of Dahl’s other short stories for adults contain elements of black humor or comedy. Nathaneal West’s Miss Lonelyhearts (published in 1933), Joseph Heller’s Catch-22 (1961), and Thomas Pynchon’s The Crying of Lot 49 (1966) are examples of other novels that utilize black humor. The plot of “Lamb to the Slaughter” is also similar in several ways to Susan Glaspell’s works Trifles and A Jury of Her Peers, both of which involve a repressed housewife murdering her insensitive husband and her motive never being understood because of male detectives’ arrogance. Inspiration. “Lamb to the Slaughter” was supposedly written by Dahl after his friend Ian Fleming (spy novelist and former intelligence officer) suggested he write a story about a woman who murders her husband with frozen mutton that she serves to the detectives investigating her husband’s case. Small screen version. The story was adapted into a television script written by Dahl and presented by Alfred Hitchcock. It aired in 1958, five years after the story was originally published. Lee, Sophia. "Lamb to the Slaughter." LitCharts. LitCharts LLC, 8 Dec 2016. Web. 24 Apr 2019. Lee, Sophia. "Lamb to the Slaughter." LitCharts LLC, December 8, 2016. Retrieved April 24, 2019. https://www.litcharts.com/lit/lamb-to-the-slaughter.